There should be a beyond excellent option because excellent is a huge understatement! The Arenui is everything and more than we imagined. We can't wait to come back. The entire crew are awesome! Truly a 'trip of a lifetime'! Wonderful experience - best dive boat I've ever been on! 1st class operation. I had very high expectations and they were met and exceeded! Overall, the boat is fabulous. It's as good as the website. Thanks guys for an unforgettable trip. Met and exceeded my expectations. This will be one that will be difficult to top!! What an incredible experience! Loved all of it and the crew was amazing!!! Second trip to this area. After more than 6,000 dives globally this is the best diving in the world. We plan on returning and bring a boat load of friends with us! I came for the photography which was outstanding and was more than pleased with the entire trip. Still the #1 top notch operation as far as I'm concerned! Happy to report that you have maintained the same high standards! Another perfect trip!! The best dive experience for a beginner in the field. Although I am not a certified diver, the Arenui crew was very accommodating and gave me a snorkel adventure with the manta rays that was the adventure of a lifetime. Wow! This was a truly life changing experience for us, we thank you for all of your hard work to make this such a special trip. Arenui has defined luxury diving for me! I will be back. After reading the website my expectation was very high and yet it still exceeded my expectation. I needed some extra help with my dive entry and had help with every dive. Thank you!! The instructors were great and I learned a lot about diving and the marine life from them. It helped me become a much better diver. I saw everything and more that I hoped to see. Best dive trip yet, by a long shot! On one of our dives at a site called El Toro we were looking to find pink pygmy seahorses. Following our trip to their seafan home two mantas passed by us. From the smallest, most fragile creature to the largest most majestic! All staff, at all times was willing to help with any issues / needs. Dive guide went above and beyond locating critters and taking care of us. Highly recommended. Great time! Thank you! Boat; things are well organized. The crew; don't change a thing! Number 1 liveaboard: The most gorgeous ship. Lovely crew and dive staff. Debbie and Jerry are awesome. I'd recommend Arenui to the divers in my home town. Enjoyed every moment on the boat and underwater. After being pampered like this, the bar of my expectation will be very high and not sure if I can find a vessel to compete with Arenui. "We shall return" to paraphrase MacArthur. Lovely boat, spacious, comfortable and classic style. The diving; extraordinary, loved the mantas and the nudis. The entire crew is over the top. They have raised the bar as far as taking care of their guests. I have been on lots of liveaboards and hands down this was the best. The boat was so different from all the other boats we have been on before. We really enjoyed the uniqueness. With an over 30% return rate you are obviously doing most everything right. Congrats! Arenui is a great liveaboard. My friends and I will put it in our diving list; that means wherever Arenui goes we will follow. We felt like the first time with Arenui: in the 7th sky 'like in paradise'. Thank you for the special days with you and hopefully we will see you again for a third trip. Another exceptional trip: crew is exceptional! Our first liveaboard and we loved it. Thanks for making sure we were safe and happy at all times. The crew; fantastic team! Made our trip fun and always insured we were content with all. Wouldn't change anything. Great boat, would definitely seek it out. Loved the crew entertainment the last night. The diving; Ali's drawings of sites were great. The crew; service was outstanding in all departments. Great dive master (Wawan). A perfect trip. Thank you so much guys. This journey will stay in my heart. To live up to our motto of being “The Boutique Liveaboard”, attention has been given to every aspect of the Arenui to ensure that it fully embodies our philosophy of providing a unique dive holiday experience. We aim to provide the best there is in terms of diving and leisure activities, without sacrificing any of the comforts and luxury you would expect to get from a 5 star hotel on land. Dive with us throughout Indonesia, the world’s no. 1 spot for biodiversity, including Komodo, Alor, Maluku, Raja Ampat and beyond! Then unwind with our professional massage and spa treatments, enjoy delicious fresh meals and rest in luxury accommodation. 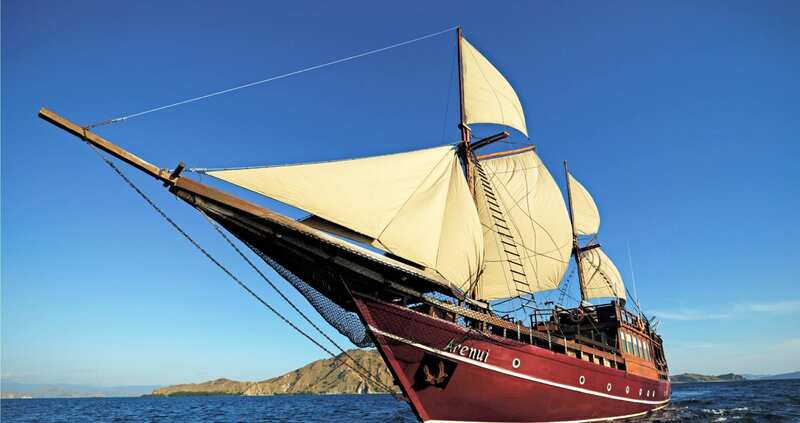 Our photogenic vessel is a traditional and magnificent Phinisi, a classic Indonesian wooden sailing vessel, set to explore the majestic underwater world of the Indonesian archipelago. Intimate but roomy, the Arenui is an exquisite ship and a work of art in itself with its wooden detailing and decorative touches. Moreover, it aims to differentiate itself from other liveaboards by providing personalized accommodation, services and facilities. Luxuriate in exceptionally spacious cabins, tastefully furnished with exquisite handicrafts from each of the Indonesian provinces. Rest easy knowing our vessel uses 70% recycled wood. Relax in our indoor restaurant or enjoy the view from our fabulous skydeck. Arenui believes that, even when sailing around remote islands, there’s no reason to forego fine dining! After all, a relaxing meal prepared with care and style is the best way to remain full of energy for the next dive! Rather than the typical dive liveaboard buffets, you will be able to choose from our daily a-la-carte menus. When it comes to the dive itineraries, the Arenui has chosen the best dive sites and the best times of year to explore these world famous destinations. Whether its nudibranchs and rhinopias you’re after, or manta rays and schooling fish, our cruises have it all. Our 4 Indonesian divemasters (Ronald, Fery, Hery and Fahmi) are rated amongst the most knowledgeable in the region. The whole operation is led by our 4 highly experienced western cruise directors. With 23 crew serving a maximum of 16 guests, we aim to make your cruise a truly relaxing and first-class experience! ARENUI: Diving cruises without the hardship! There’s so much to see in Indonesia, underwater and on land, that one trip will never be enough! Indonesia's boutique dive liveaboard experience!